Chipotle Chicken Stir-Fry with Rice (serves 6) | Crappy Kitchen - Good Dinners! ← Introducing SweeTerra Farm! A New Farmer, Chickens, Rabbits, Goats, Turkeys and 2 Toulouse Geese! chipotle laced chicken stir-fry: The BEST! Right now the supermarkets are over-flowing with avocados and they seem to be on sale everywhere I go. This is what prompted me to make this. 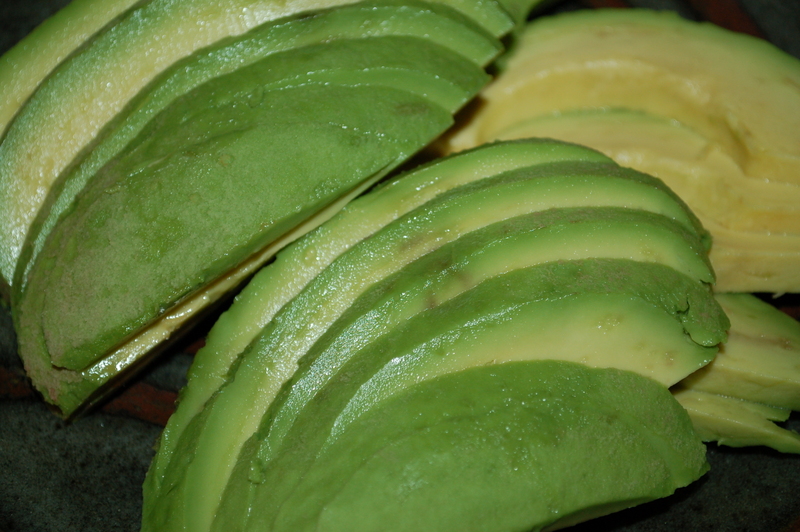 I love to combine the cool creaminess of avocado with something spicy and crunchy. Make it up as you go along and it will be luscious! 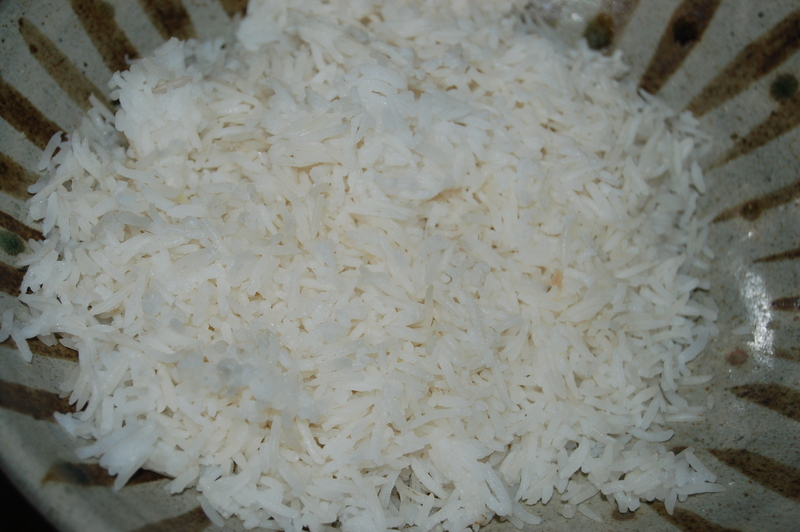 Cooked basmati rice – *if using a rice cooker, use 3 cups of raw rice in your rice cooker cup measure. If using stove-top, use 2 regular cup measures of rice. Cook both according to instructions. 1 – Cook rice. when cooked set aside. No need to keep warm. 1 – Put chopped chicken, 2 tbs olive oil, chipotle peppers and sauce, garlic and lime juice into bowl and combine. Set aside for about 20 minutes. Can be made ahead of time and left in the fridge. 3 – Put big saute pan on medium to high (more towards the high side but not all the way up), heat and add the last 2 tbs of oil. 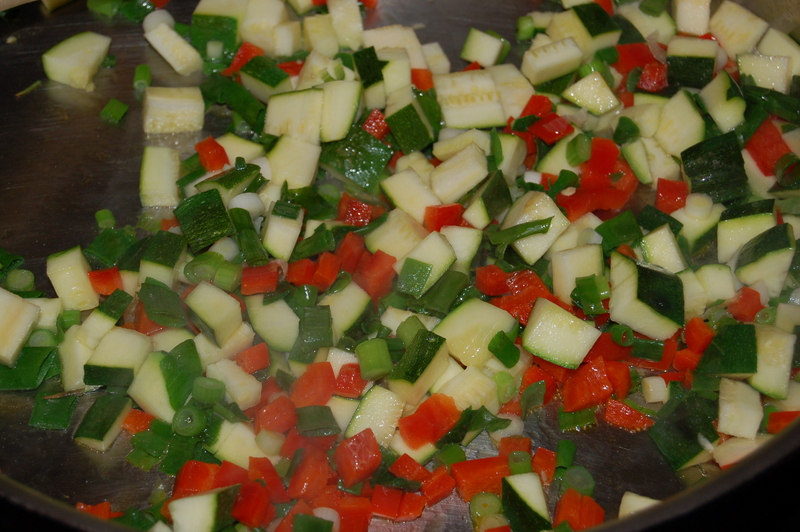 When it is hot, add the chopped veggies and stir-fry for about 5 minutes, stirring frequently. Remove to a plate and set aside. 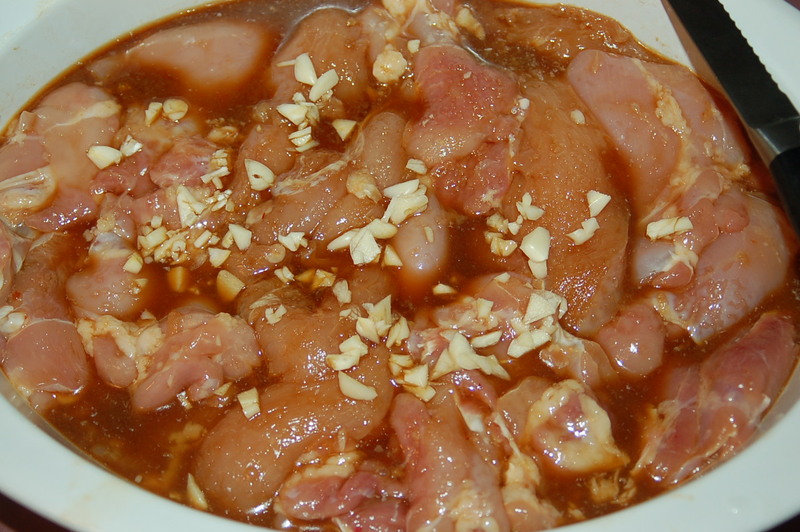 4 – Turn the heat up to high and immediately add 1/2 of the chicken mixture. *If you add all of the chicken in one batch it will end up getting too moist and will steam more than stir-fry* Cook in an even layer for between 4 to 6 minutes. Taste a little to be sure it is cooked. 5 – Add the veggies back to the pan and turn heat off. Divide rice and chicken mixture between warmed plates or bowls and add a “fan” of avocado slices to each plate. I like to add some tapatio hot sauce (press here for more info on this hot sauce), and a cooling spoonful of sour cream to each serving, but each to his own! 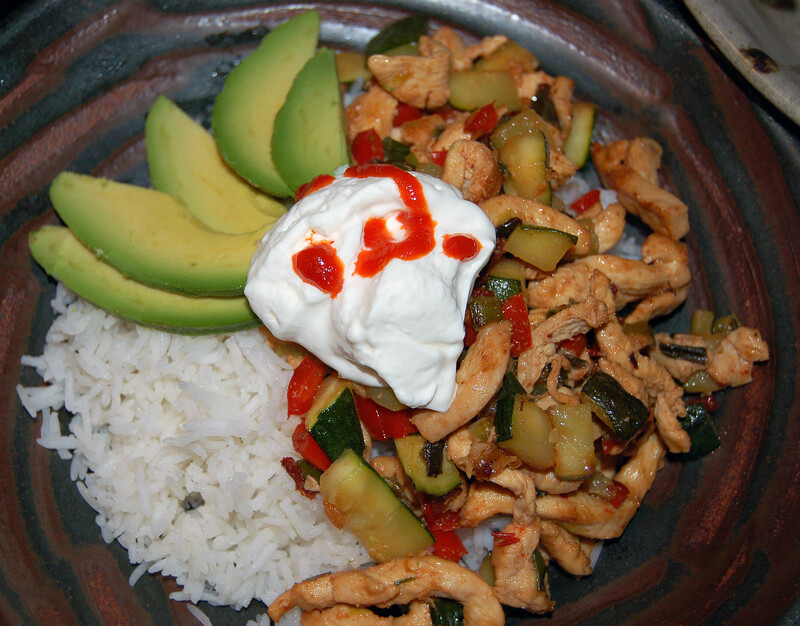 This entry was posted in dinners and tagged adobo sauce, avocado, bunch scallions, chicken stir-fry, chipotle peppers, chipotle peppers in adobo sauce, easy dinner, haas avocados, hot sauce, sour cream, stir-fry, tapatio, tex-mex. Bookmark the permalink. Exactly what i was looking for! Cooking this tonight for me and hubby 🙂 mixing up the veggies tho since i have no zucchinis. Yum yum yum!